Up until recently, aerogel was known as the world’s least dense material. With a density of just 1 mg/cm³, aerogel is nearly all air but incredibly strong. Now, a group of researchers at two German universities have created an even less dense material called aerographite. 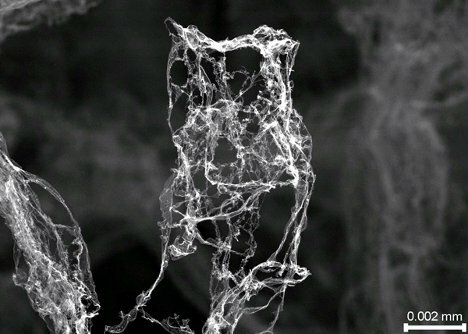 The material, made of a network of hollow carbon tubes, boasts a density of less than 0.2 mg/cm³, making it nearly all air. 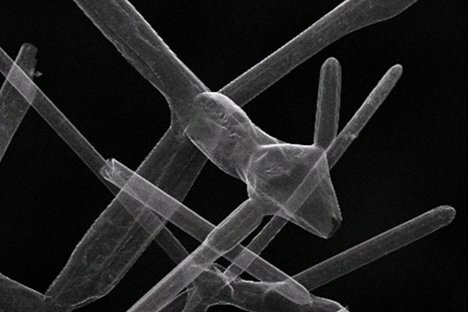 Seen here in electron microscope images, aerographite is barely there at all. It looks like it would snap under any type of pressure, but it can be compressed by a factor of a thousand before popping right back, unharmed. It conducts electricity and can support more than 40,000 times its own weight. The applications for this crazy material include ultra-lightweight batteries and who knows what else – give a bunch of scientists a wonder material and they’re bound to do something pretty cool with it.